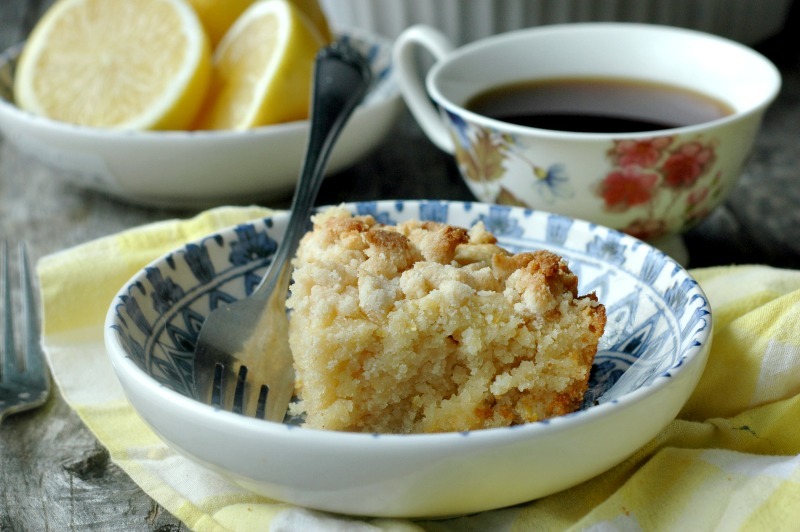 Soft and lightly sweet gluten free lemon coffee cake with ingredients you can feel good about! A bit of fresh citrus to brighten our long winter! 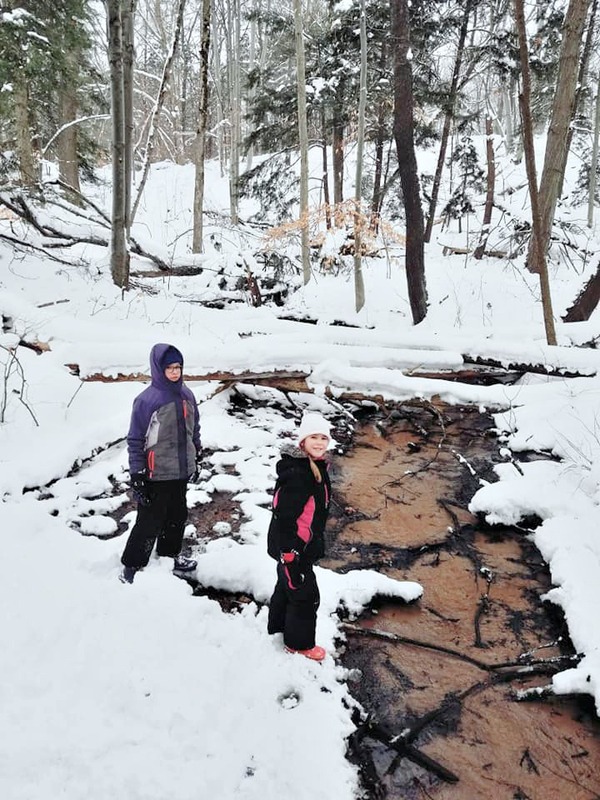 These long Michigan winters! We sure do make the best of it, but by the end of February we long for something to brighten our moods a bit! I’ll always be forever thankful for whatever areas of California and Southern states are sending the citrus our way during February each year, because we really enjoy it! A fresh and bright new breakfast! 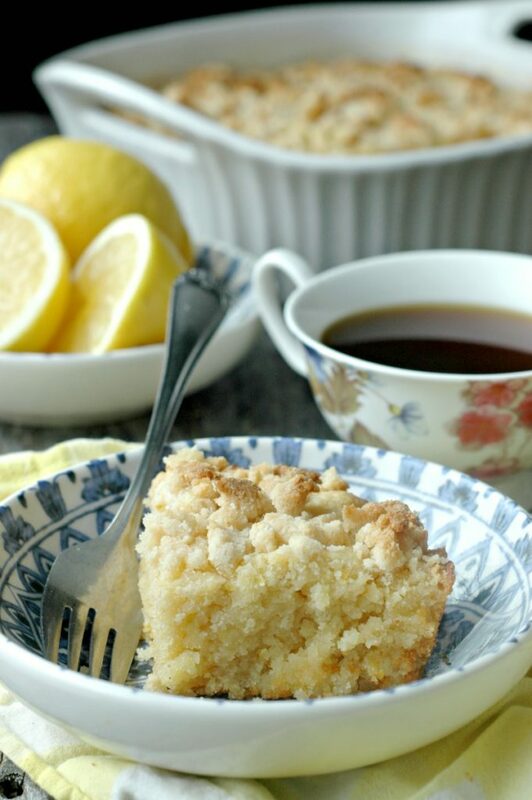 Lemons and honey are a match made in heaven, and this lemony sweet coffee cake is no exception! I have fallen in love with the grain free combo of cassava and almond flours together lately. You won’t miss the regular flour with the soft, almost “gluten-like” texture of this coffee cake. And the honey sweetened lemon brightness is the perfect start to the day! Quick prep & low fuss! Because real life, right momma?! Whether you are making this coffee cake for a special Easter brunch, or your weekend breakfast, the prep time won’t take you all day in the kitchen with these simple ingredients. Even the crumb topping is a simple mix into a bowl! You can swap the 2 cups of grain free flours for 2 cups of Namaste GF Flour blend if you do well with grains. I love the resistant starch of cassava plus the fat and protein in the almond flours, but understand not everyone can tolerate those. I also plan to make the coffee cake with just the GF Flour blend as well as I truly think rotating our food ingredients and not always eating the same thing is important! Egg free friends, this recipe only has ONE egg! Woot! That means a flax egg, gelatin egg, or other egg replacer should work just fine. I even think an applesauce egg would be ok. I seriously love almond extract with the flavors of this coffee cake, but if you don’t have that around, vanilla extract will work too. The crumb topping is super forgiving and customize-able. I have done coconut shreds mixed with some of the flour. I have done blended walnuts mixed with some of the flour too – you can use what you have on hand. I did take some leftovers of one of the batches that I made of this lemon coffee cake to freeze, and it thawed out great. If you have an abundance of lemons, you sure could double this up into 2 square pans so you can freeze some slices of coffee cake for busy school day mornings. 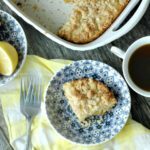 Gluten Free Lemon Coffee Cake :: Paleo Friend & Honey Sweetened! Pre-heat the oven to 325 degrees, and grease a 2 quart baking dish with butter, coconut oil, or palm shortening. Blend the butter, honey, lemon zest, and almond extract in a medium mixing bowl until creamed. Add the egg, coconut milk, ACV, and lemon juice, and blend to combine. Add the flours, baking powder, and sea salt, and blend until just combined, and then pour the coffee cake batter into the greased baking pan. Combine the crumb topping ingredients int a small bowl, and sprinkle over the top of the coffee cake. Bake at 325 degrees for 40 minutes, or until the middle is set and the top is lightly golden brown. 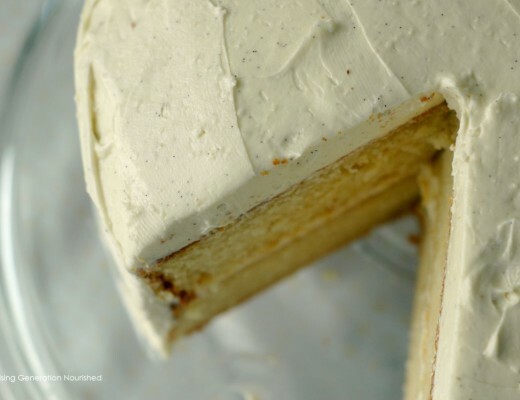 Cool the coffee cake at least 10 minutes before cutting and serving. The coffee cake holds together and firms up as it cools. Gosh darn this looks so amazing!! Cassava is one of my favorites, and the lemon!!! Oh, my mouth is watering! I’ve been craving lemon things lately. I love that this is honey-sweetened! 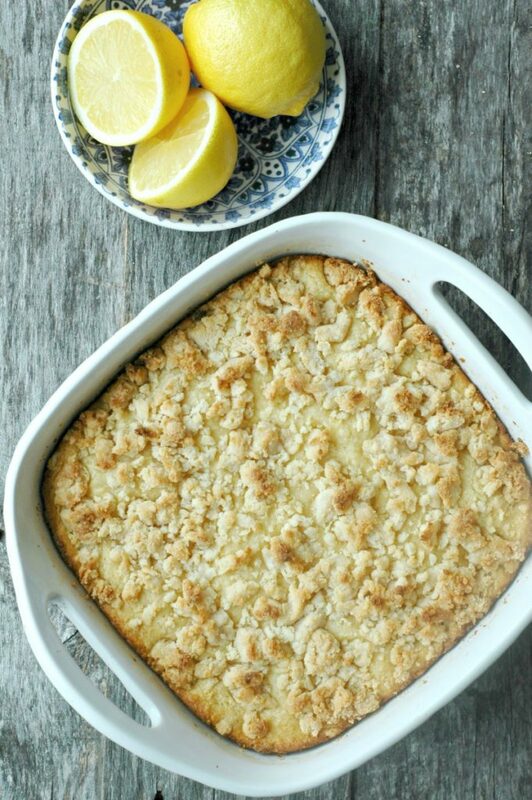 I’m a huge fan of anything lemon but have yet to try lemon coffee cake! 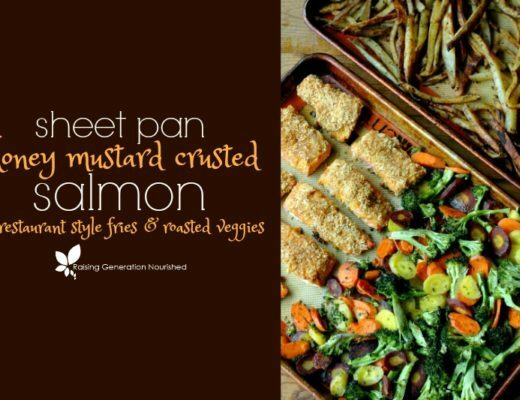 Pinning this recipe to make later! Lemon desserts are seriously the best and this looks amazing! I bet it’s perfect with a mug of coffee in the morning. 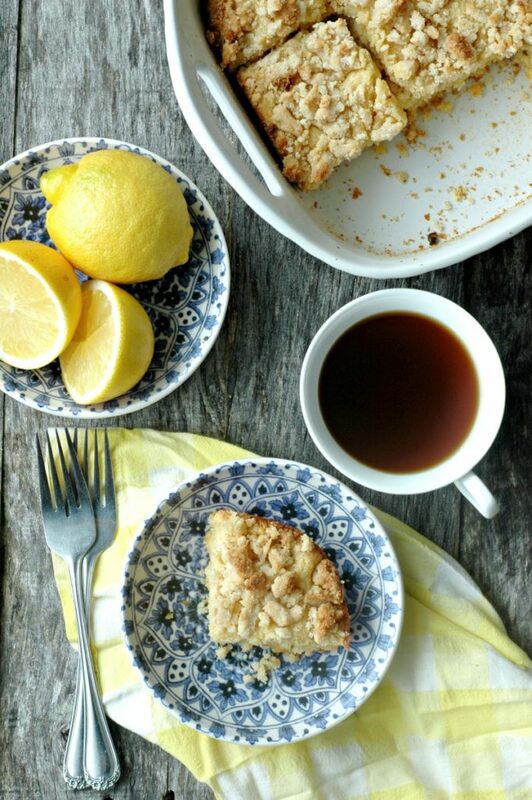 Never seen a lemon coffee cake before – LOVE this idea! And that topping! This sounds utterly divine! So looking forward to trying it! This looks delicious, I love lemon in baking! My family would love this! This is my kind of treat! 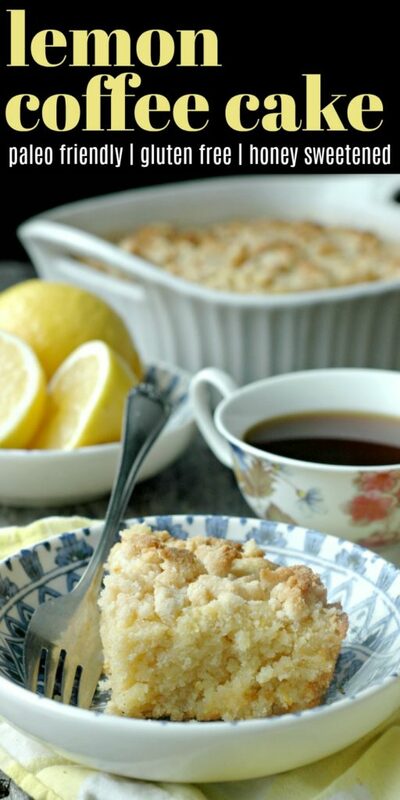 Lemon is my favorite and I love the look of the crumble on it! Thanks for creating these wonderful GF idea.. I am not celiac and have not been ‘tested’ for intolerance, but in my opinion, the more we can avoid GLUTEN, the better we all are.. When we can create a repertoire of dishes we are comfortable making, we are ahead of the game. 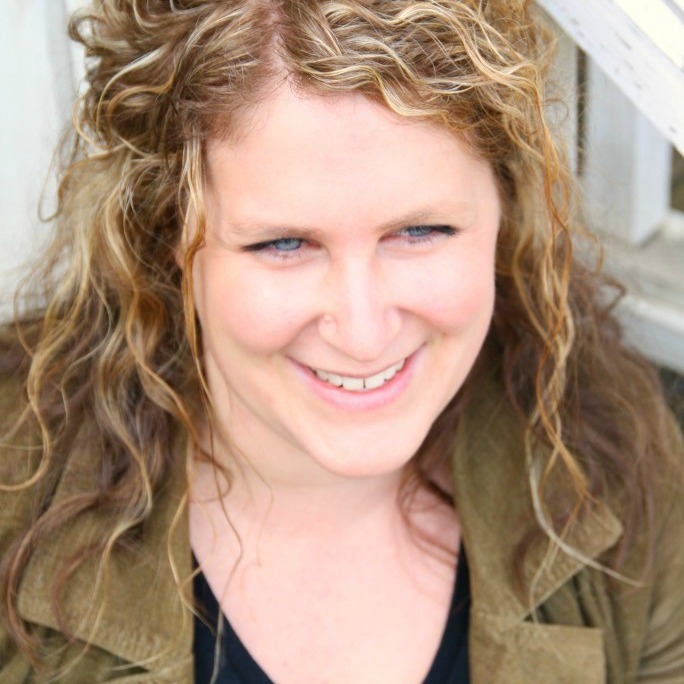 In my herbal practice, I encourage these alternatives as SO many people do ‘test’ for sensitivity and feel SO much better ‘off Gluten’ or with limited gluten. Thanks again! This lemon cake will brighten up any winter day! 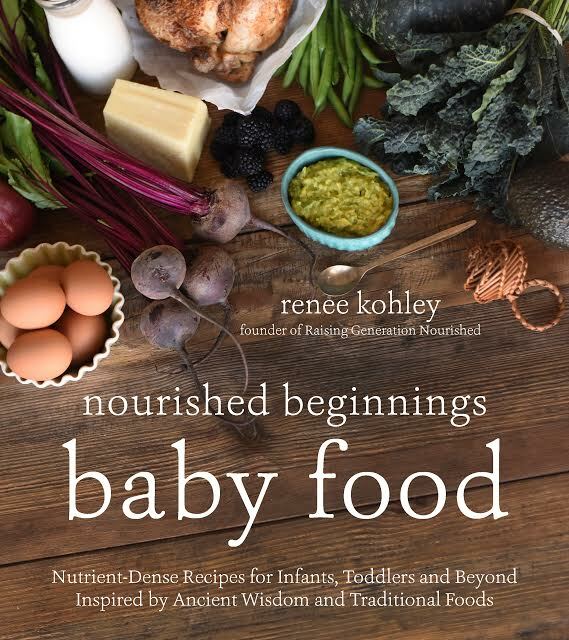 I love all of the healthy ingredients in here too. So super odd, I HATE lemon drinks (lemonade, no thank you), put passionately LOVE lemon treats and sweets. 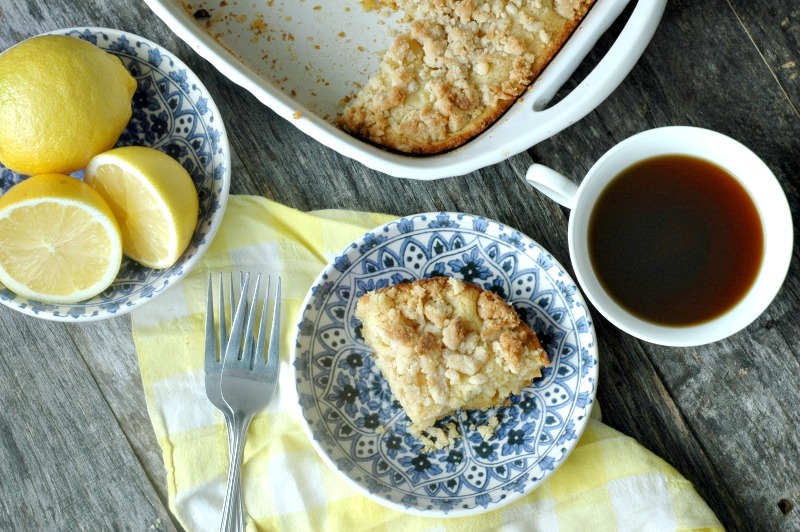 A gluten-free lemon coffee cake is the bee’s knees! And then I can have dessert for breakfast, guilt free. That looks so delicious! Totally love it! We’re having the exact same thoughts right now, I’m just craving anything lemon to ‘brighten’ things up and I definitely need to make this next weekend!